I wrote a small script that cleans up Lasso 8's internal SQLite database from dynamically created tables in MySQL. It also deletes the dynamic tables from MySQL when older then 2 days, so you do not need a separate script for that. In my case, the script has been written to clean my dynamically created temp tables, which names all begin with 'REP'. But you can copy the script and of course modify it to your needs. Suppose you have a nice setup where a page interacts with the server via AJAX-calls and executes a Lasso file on the server to get some data. You don't want this file to be called directly via the URL-bar in a web browser, or via other self-made web pages by others who try to access it via a copy of your page. Anybody can see which AJAX-files your page is calling, so for some it is always a challenge to execute them outside the normal webpage to see what data will come up. Might be of interest! So you want to prevent that, somehow. There is a Lasso-tag called referrer_url, which returns a string containing the URL that requested your AJAX-page. If you look into this string for a domain name or a path that only you have, you can block execution if the requestor is not coming from your server. When a page is called directly in the browser, the referrer_url is always an empty string. Which is logical, since the page was not referred to by another page. Suppose I have a page mypage.html with a jQuery auto-complete implementation in it. This auto-complete can of course be used by more than one page and you do not want people to try it out in other ways. So this gives you some protection from just try something-users. Add a login-system, which restricts the number of users that might want to hack your pages - you can trace their actions on your site. In that case, add a check if the user is logged in. You must execute your complete login-sequence in your AJAX-pages too, as with 'normal' pages, since the xhttprequest is a normal HTTP request and thus the browser sends the same HTTP-headers and cookies, etc.. to your AJAX-page. But, as with everything web-related, nothing can be trusted. I am building a website where I need to find people based on their postcode and have been searching the past month for a good and cheap solution. From solutions costing around €2000 down to solutions costing €500 down to one which costs only €99 for a latitude/longitude database of Dutch postcodes, to be found at GEODATAS.net. On their website is sample code present and I converted the PHP-version to Lasso 8 code. —> Click here for how-to and demo code. As stated in their email in which I received this medal: pure bragware! In that case ... Let's brag! I have created a page of how I recently found a cool way to use #RapidWeaver, #Lasso and #Coda at the same time and use RapidWeaver only for the framework, which it does very good. I have created a quick example on how to create a graph with Flot and Lasso Professional. Flot is a really cool graphing library and Lasso is a cool programming language. Together, they create a great graph! 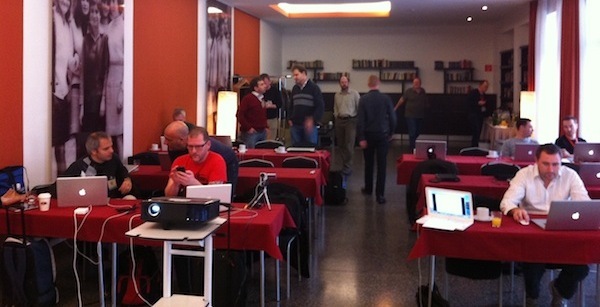 The Euro Lasso Developer Conference 2010 was held in Berlin on 30 and 31 of october 2010 @ GLS Campus Berlin. Organized by ANU Internet Services, this was a great idea and happening. 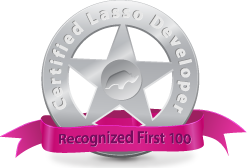 The brand new Lasso 9 was discussed very much; various demos and presentations of code and sites built with Lasso 9. LassoSoft announced they found an investor and were getting back on track! Only good news - of course! It was nice to meet fellow developers who I normally only have contact with by reading and posting to mailing lists. Thanks to Chris Wik from ANU for his spontaneous idea and rapid put-together of a well done DevCon!